Yukon & Pat McDonagh get standing ovation at Canadian Festival of Fashion. A new combo has arrived on the International fur scene – Pat McDonagh for Yukon Furs. When two totally dedicated experts in their fields – McDonagh for Fashion design and Chris Anthopoulos for his internationally acclaimed work in furs – combined their respective talents, the results bring even fashion aficionados to their feet as evidenced at the recent Festival of Canadian Fashion held in Toronto. 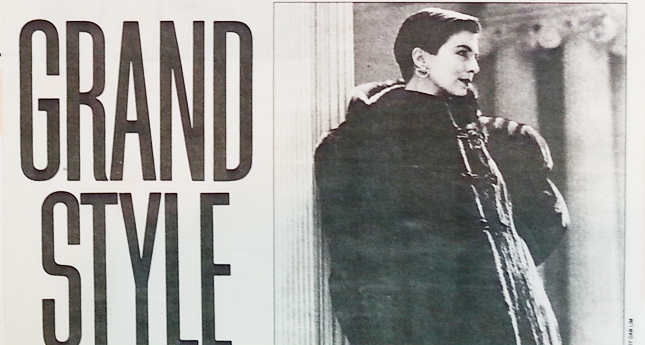 As reported in Women’s Wear Daily, Friday, May 16, 1986, “Toronto’s Pat McDonagh’s first fur collection for Yukon Furs with a striking mix of sophistication and whimsy” was strong. 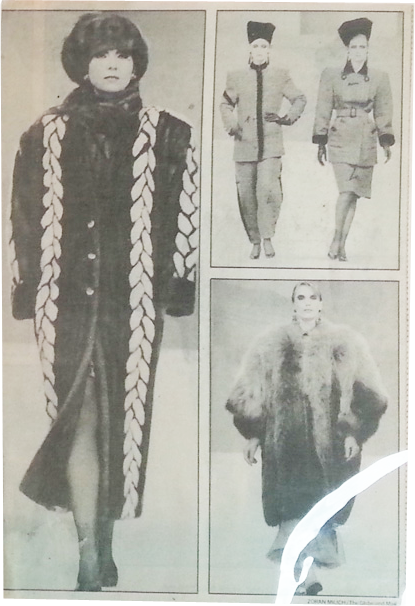 A sizable grouping of coats under the Pat McDonagh for Yukon Furs label encompasses the current high fashion trend to the lushly large… a huge fox coat is worked in chevrons from mocha to cream… raccoon appears in an easy-shaped kimono style with sleeves that stop short to reveal under sleeves of a contrasting texture… pal minks have thirties-style asymmetrical collars… a collection of minks show contrasting mink cable stitching and cardigan style fox coats sport single skins, beady eyes and all. Chris Anthopoulos has built his Yukon Furs into an international fur leader with traditional stylings, expertly crafted. He started his career in Greece at the age of 13 with the burning desire to work in fur. He has received 3 international awards for excellence in matching skins and quality of craftsmanship. With this collection, Mr. Anthopoulos has boldly complimented the classics with Ms McDonagh’s strong, aggressive broad-shouldered, contemporary designs… ideal for the contemporary woman who wants to make an investment in the best of fur interpreted with fashion verve. It certainly was. The crowd was on its collective feet, roaring approval for her fall and winter collection which included a sizable grouping of coats she designed for Yukon Furs. Those toppers, all lushly large in the international mode, started off with raccoon, shaped into an easy kimono, its sleeves stopping short to show off under sleeves of a contrasting texture. There was a huge fox coat worked in chevrons, shading from cream to mocha, a collection of minks with contrasting mink cable stitching – just like your favorite cardigan – pale minks with Thirties-style asymmetrical collars and accessories of the period’ a mink tippet, a fox mulf and single skins of foxes, beady little eyes and all. 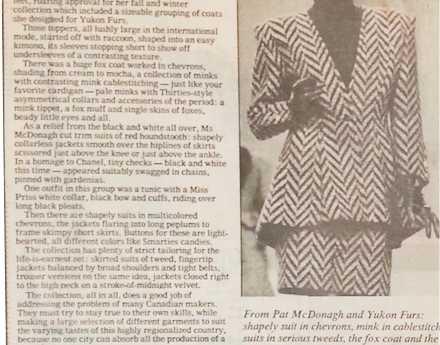 As a relief from the black and white all over, Ms. McDonagh cut trim suits of red hounds tooth: shapely collarless jackets smooth over the hip lines of skirts scissored just above the knee or just above the ankle. In a homage to Chanel, tiny checks – black and white this time – appeared suitably swagged in chains, pinned with gardenias. One outfit in this group was a tunic with a Miss Priss white collar, black bow and cuffs, riding over long black pleats. 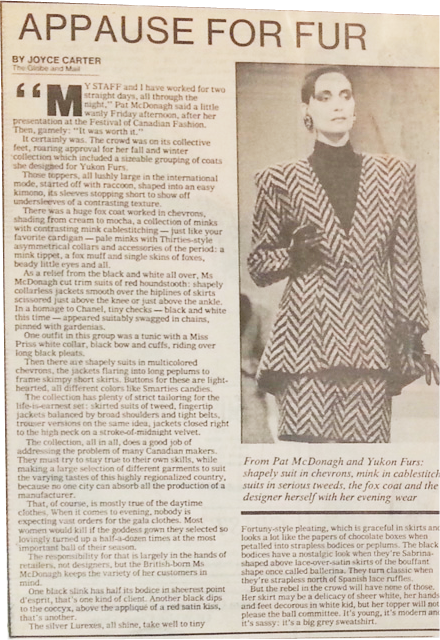 Then there are shapely suits in multicolored chevrons, the jackets flaring into long peplums to frame skimpy short skirts. Buttons for these are lighthearted, all different colors like Smarties candies. The collection has plenty of strict tailoring for the life-is-earnest set: skirted suits of tweed, fingertip jackets balanced by broad shoulders and tight belts, trouser versions on the same idea, jackets closed right to the high neck on a stroke-of-midnight velvet. The collection, all in all, does a good job of addressing the problem of many Canadian makers. They must try to stay true to their own skills, while making a large selection of different garments to suit varying tastes of this highly regionalized country, because no one city can absorb all the production of a manufacturer. The responsibility for that is largely in the hands of retailers, not designers, but the British-born Ms. McDonagh keeps the variety of her customers in mind. One black slink has half its bodice in sheerest point d’esprit, that’s one kind of client. Another black dips to the coccyx, above the applique of a red satin kiss, that’s another. The silver Lurexes, all shine, take well to tiny Fortuny-style pleating, which is graceful in skirts and looks a lot like the papers of chocolate boxes when petalled into strapless bodices or peplums. The black bodices have a nostalgic look when they’re Sabrina-shaped above lace-over-satin skirts of the bouffant shape once called ballerina. They turn classic when they’re strapless north of Spanish lace ruffles. But the rebel in the crowd will have non of those. Her skirt may be a delicacy of sheer white, her hands and feet decorous in white kid, but her topper will not please the ball committee. It’s young, it’s modern and it’s sassy: it’s a bug grey sweatshirt. An excellent evening at the Fashion with Flare event in benefit of Trillium Health Partners. The fashion show featured models in Yukon Fur coats & La Nuit Lingerie & Tara Fava Jewellery. 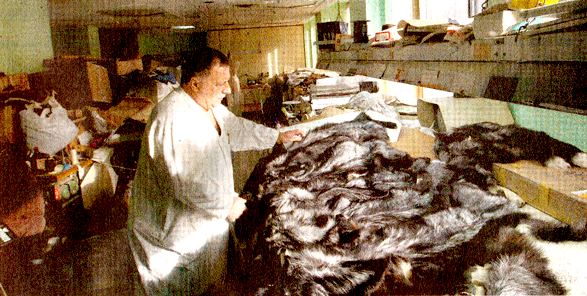 …most furriers do – except at Yukon Fur – we only use the highest quality pelts. 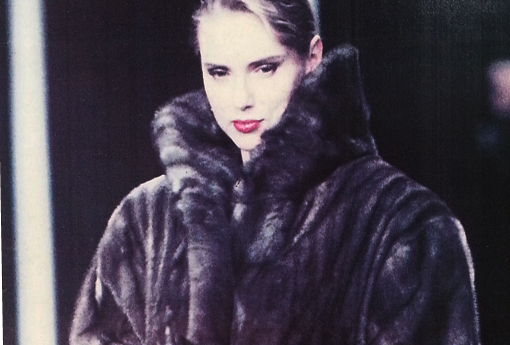 [Pictured is a ranch mink reversible 3/4 length coat, Pat MacDonagh for Yukon Fur – the only Furrier and Fur Designer to be included in the Fashion Annual] The Label Rumors of her demise are greatly exaggerated. “I’ve never gone bankrupt. I’ve just got sick of hearing people say that I’ve gone out of business….